While most people think of almonds as a nut, it is actually the seed of the almond fruit. The fruit itself is closely related to peaches, cherries, and apricots, and comes from a tree with sweet-smelling pink and white flowers WHFoods.com said. As for the nut, it is contained in a hard shell, and has thin brown-colored skin and white flesh. Almond nuts come in two types. The sweet type is the one that is used for eating and cooking. They have an oval shape with a slightly pointed end, and a slightly chewy texture. They can be bought in shells, or with their shells removed. Those that have been shelled are available in many different variants: whole, sliced, slivered, blanched, skin on, or with their skins off. Almonds are also ground to make almond milk or almond butter. Bitter almonds are inedible as they are, because they contain some toxic substances. They are, however, used to make almond oil. Almonds are grown in Mediterranean countries such as Spain, Portugal, and Morocco. In the United States, California is the only state that produces almonds. Almonds are known for being a rich source of nutrients and eating just a handful a day can benefit the body in many ways. 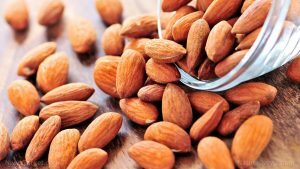 Almonds promote heart health with their high levels of magnesium, a mineral which is associated preventing heart attacks, AuthorityNutrition.com said. The magnesium in almonds also maintains the balance of HDL and LDL cholesterol levels, preventing hypertension. At the same time, magnesium regulates blood sugar levels, which makes almonds efficient in managing diabetes. Because they are low in sugar and high in protein and fiber, it only takes a small amount of almonds to make one feel full, making it useful for weight control and maintenance. Some studies show that the nut may also inhibit the absorption of calories in the body and boost metabolism. It should be noted that almonds do have a high calorie content, so they must be eaten in moderate amounts. Almonds are also full of antioxidants, which can be found mostly on the nut’s skin. This antioxidants play a role in cancer prevention, reducing oxidative damage that causes cancer. Almonds are particularly high in Vitamin E, a group of antioxidants that protects the cells from damage and has been associated with Alzheimer’s disease prevention. Almonds are not difficult to incorporate into your daily diet. The nut has a nutty, slightly buttery flavor that goes well with both sweet and savory dishes. They are most commonly eaten as a snack, whether on their own or combined with trail mix. They can also be included in salads, pasta dishes, granola bars, and pies, as recommended by SouthernLiving.com. At the same time, almond milk is a delicious, dairy-free alternative to cow’s milk, and can also be included in soups and smoothies. Reduce risk of heart disease by replacing America’s favorite foods with almonds or almond butter! Almonds are high in magnesium which supports cardiovascular health. Almonds are useful for weight loss as they can prevent calorie absorption and boost metabolism. They can be helpful in preventing cancer and Alzheimer’s. Almonds can be helpful with diabetes control.